Basement is a need of every house today, but according to Vastu basement should be avoided in residence because low room/space or empty space under the house is not considered auspicious. However seeing the requirement of people, basement if made in house should not be used for living or sleeping purpose. This place compliments with basic rules of Vastu which must be followed in order to discard negativity that may arise due to basement in a house. 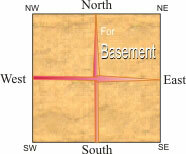 Primarily basement should be built in Northern or eastern direction of house as according to Vastu principles there should be more space in east and north than south or west. The purpose of basement should be either for storage or other things rather than living or any other recreational purpose. Place all the junk stuff including heavy equipments in the southern and western direction while make sure the shape of basement is regular i.e. square or rectangle. An ill shape basement can cause inevitable losses and hinders health of people. About 1/4 of area of basement should be above ground. Proper height of a basement should be atleast 9 feet. Heavy stuff must not be kept in north or east of the basement. Paint your basement with light and subtle colours and avoid dark tints.